A haemangioma is a growth or swelling of the cells that line the blood vessels. For this reason, it is considered a vascular tumour, although it is benign (ie, not cancer). The terms ‘strawberry naevus’ or ‘strawberry haemangioma’ are commonly used. This is because if they are located on the surface of the skin, they look like a ripe strawberry. However, if they are just under the skin they often appear as a bluish swelling. Haemangiomas can also occur on the liver and can also grow in other internal organs, such as the larynx, or small and large intestine. These vascular tumours are generally self-involuting which means they disappear on their own over time. A general rule of thumb is that 30% of haemangiomas will involute by 3 years of age, 50% by 5 years of age, 70% by 7 years of age and more than 90% by 9 years of age. Most haemangiomas do not cause any other physical problems, although it is possible that some may be associated with skin ulceration and bleeding and they can cause parents in particular distress because of their physical appearance. The haemangiomas that are present in internal organs can interfere with vital functions such as vision, feeding, or breathing. 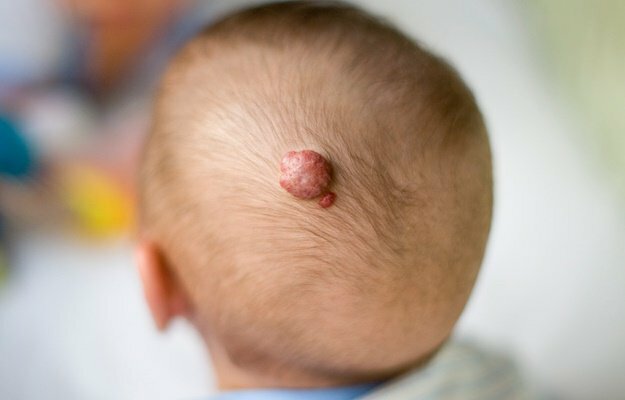 We will discuss whether your child’s haemangioma is in a location where there is a higher risk of complications and will offer you the treatment option which we feel is best suited to your child’s specific lesion.